At HM Manufacturing it's important to us that every part we manufacture is made with the correct specifications. Our equipment and quality inspection services are here to ensure that all standards and requirements are met for each product. We proudly offer the ability to make any part PPAP certified and FAI (First Article Inspection), for a multitude of industries. ERP system: integrated and continuously updated view of core business processes using common databases. This allows each product to be tracked through each phase of production. Ensuring traceability of the production run if any questions arise. PPAP Capability: The Production Part Approval Process requires that parts made must meet a specific standard. Used to formally reduce risks prior to product or service release and ensures the manufacturer has the ability to create a product that is up to code and top quality. Optical Comparator: An optical comparator is a device that applies the principles of optics to the inspection of manufactured parts. In a comparator, the magnified silhouette of a part is projected upon the screen, and the dimensions and geometry of the part are measured against prescribed limits. The optical comparator gives ability to determine if the product meets exact measurements and shape as the design. Coordinate Measuring Machine (CMM): A CMM is a device for measuring the physical geometrical characteristics of a product. Measurements are defined by a probe attached to a moving axis of the machine. 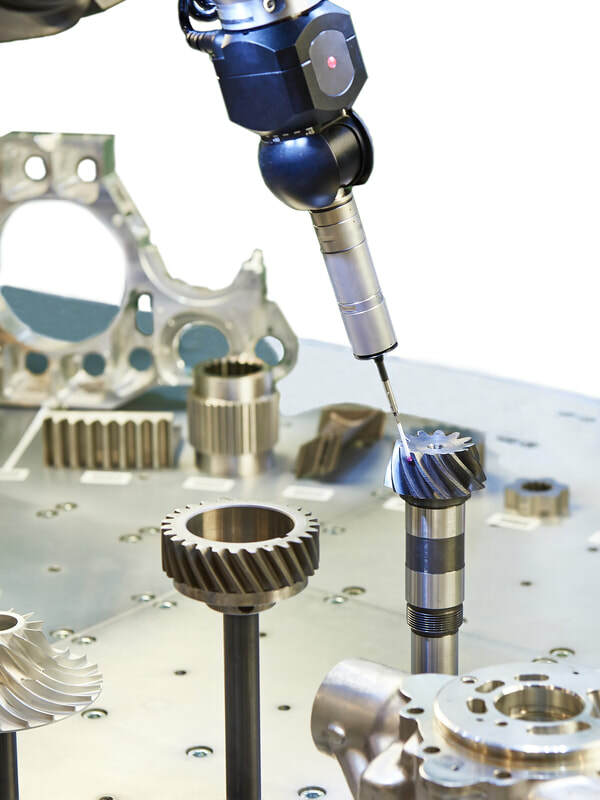 Our CMM uses a renishaw probe to identify any errors in the tolerances of the product. It allows us to guarantee correct dimensions and measurements of each product. HM Manufacturing values the Lean Six Sigma methodology and practices those aspects in our facility to further enhance our productivity, reduce waste and optimize prices. Contact us with any questions about our quality and measurement services.